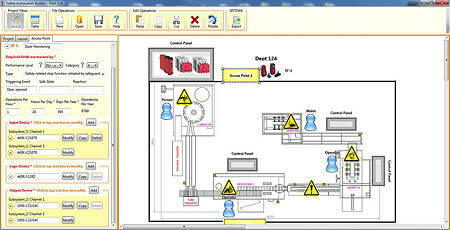 Traditionally, engineers have needed to go through a laborious process of: printing machinery-layout drawings; drawing hard and movable guarding; identifying potentially hazardous access points and required safety functions; selecting safety inputs, outputs and logic devices; and calculating the achieved PL for the safety system. This has resulted in handwritten lists of required materials and safety calculations that engineers have to transfer into documents, drawings and reports. The SAB software (above) automates the process, speeding up system design and minimising human error. Users simply import an image of their machinery and answer questions using a drop-down menu and help screens to identify and select the necessary safeguards. The software then draws up product selections, generates a bill of materials, and compiles the data needed to populate the Sistema (Safety Integrity Software Tool for Evaluation of Machine Applications) utility developed by IFA in Germany. Sistema calculates the attained PL of the safety system using ISO 13849-1. 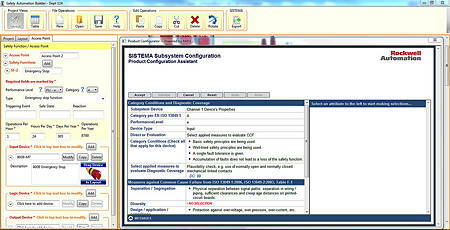 Users also receive a Sistema project file. To support the SAB tool, Rockwell has also released a series of pre-engineered design documents to help users navigate the safety-system design process and to apply best practices. These documents, known as Safety Functions, contain detailed information for each method of safeguarding, including specific functionality, the PL, and required input, logic and output components. They also include parts lists, electrical drawings, a Sistema project file, and verification and validation plans. After going through the SAB process, users can select the appropriate Safety Function for a particular machine and combine it with the bill of materials to design a complete safety system. Rockwell is launching a series of these Safety Functions in three phases. The first six are now available. Each one includes an Allen-Bradley Guardmaster safety-relay version and a GuardLogix programmable safety controller version for the safety logic element. The SAB software can be downloaded from Rockwell’s Web site. Users also need to download Sistema from IFA’s Web site.